New Revised Standard Version. xxviii + 637 pp. New York: Oxford University Press, 2011. $35.00. What might this be, a "Jewish Annotated New Testament"? In what sense "Jewish"? As the co-editors – Amy-Jill Levine, Professor of New Testament and Jewish Studies at Vanderbilt University and Marc Zvi Brettler, Professor of Blblical Studies at Brandeis University – point out in their Preface to the volume, there are several senses in which this is true. First, a specific aim of the textual annotations and other explanatory material is to highlight the Jewishness of the New Testament. This includes both the manifold ways in which the New Testament text displays continuities as well as contrasts with Tanakh (the Hebrew Scriptures), and the hermeneutical insights that can be gained from the other roughly contemporary Jewish literature, such as the Dead Sea Scrolls, Philo, Josephus, etc. This highlighting of the Jewishness of the New Testament has been done before, but hardly in such an attractive and usable form or by such an impressive array of scholars: some 50 of them, from North America, Europe, Israel, and Australia – all of whom are Jewish! That is the second way in which this is a "Jewish" work: it is written entirely by Jews. As such, it is an astonishing sign of how far the Jewish-Christian interface in our time has come. There have been notable Jewish scholars of Christian origins since at least the middle of the last century, including such luminaries as David Flusser and Geza Vermes. But who knew, prior to the appearance of this book, just how many such Jewish New Testament scholars there are in the current generation, and how widespread. The new energies and new perspectives that they bring will surely enrich the whole enterprise of New Testament scholarship, as can already be seen in the pages of volume. The Jewish Annotated New Testament is Jewish in yet another sense: it is intended, in part at least, for Jewish readers. The average Jew, as the editors point out, has no acquaintance with the New Testament, and may be hesitant to pick up a copy emanating from Christian sources, not wanting to be the object of proselytism. This volume comes to him with the imprimatur, so to speak, of the Jewish scholarly community, and the assurance that concerns of Jewish readers will be addressed. These concerns include above all what they have heard of the antisemitic or anti-Jewish nature of the material. The authors are forthright in dealing both with the most explicit passages of this nature (e.g., I Thessalonians 2:14-16) and with the general anti-Jewish animus of large portions of the text. Christian readers, too, will benefit greatly from this aspect of the commentary, which is, quite properly, never exculpatory, but often helpfully explanatory. The format of the work is that of a regular "study bible," with the text itself printed at the top of each page and the annotations at the bottom. The text used is the full and unedited text of the New Revised Standard Version, the most common translation used in North American churches, as authorized by the National Council of Churches. The annotations, following the text verse by verse, typically take from a third to a half of the page. Supplementing these are occasional boxed comments going into more detail on particular topics. An individual Jewish scholar has provided the annotations for each of the 27 New Testament books. 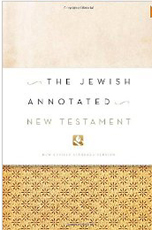 In addition to all this, the back of the book provides 87 pages of further scholarly essays on themes such as Common Errors Made about Early Judaism, the meaning of key terms such as "the Law" or "the Jews," Jewish Movements in the New Testament Period, Midrash and Parables in the New Testament, Jesus in Rabbinic Tradition, and two dozen other pertinent topics. There are also chronological charts, various lists and tables, and an extensive glossary and index. The book is printed on excellent quality paper and gives every evidence of having been prepared to serve as a long-term reference work. The purpose of this brief review by someone who is not himself a professional New Testament scholar is simply to call this volume to the attention of interested persons. More scholarly assessments will no doubt be forthcoming. Meanwhile, the volume will surely commend itself broadly as a very substantial and a very intriguing contribution to contemporary interfaith discourse. *Founding Director, Institute for Jewish-Christian Understanding, Muhlenberg College, Allentown, Pennsylvania (USA.). Former Managing Editor, www.jcrelations.net.